In the shadow of Charlie Parker, dazzling technique, blistering speed, the late Fifties saw many many battles of saxophone prowess where the liner notes become essential reference to tag the running order of the soloists. 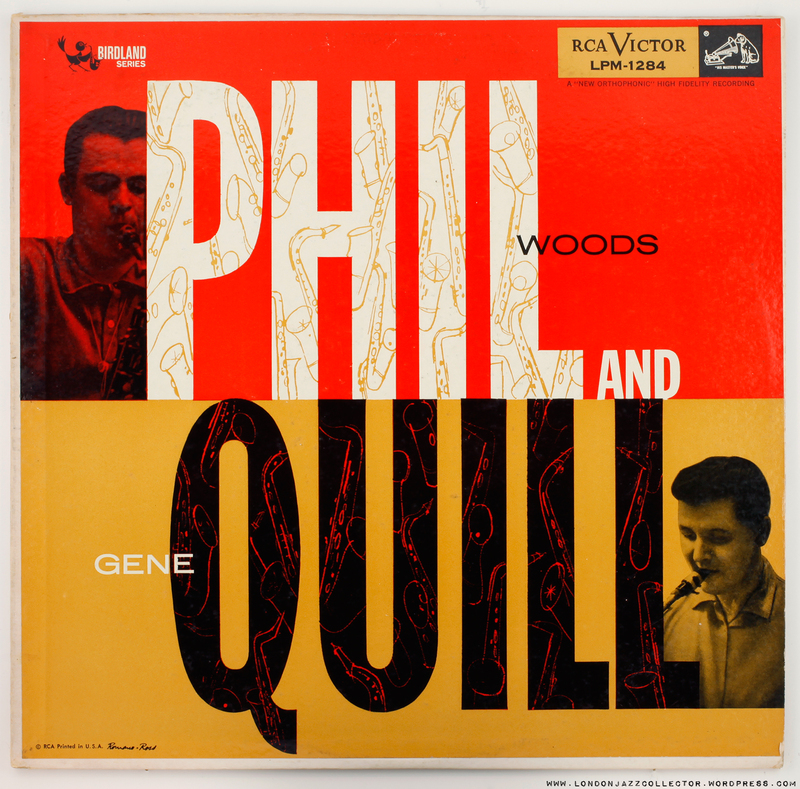 Phil and Quill here pit alto against alto in a running series of chases, of seldom matched exuberance. Prestige original design: – well, what is there to say? Hi Phil, Hi Gene. Source: Record store: Central West London. The saxophone is arguably the most expressive instrument of the modern jazz front line. Nothing comes close to it for capturing emotion except possible trumpet in the right hands. It is effectively a voice which carrys the unique inflection of the individual musician, such that no two players of the same instrument sound alike. On alto, Konitz, Woods, Pepper, McLean, Stitt, all immediately recognisable. Sadly in the wrong hands the alto morphs into smooth jazz and fusion nightmare, hot licks constantly straining at the upper register, each climax seeking to overtake the preceding climax : Kenny G, David Sanborn, nothing has me reaching for the off switch faster. There is more to music than end-to-end musical climaxes. ( I thought long and hard about that sentence, snigger, but you know what I mean? ) Music deploys the whole gamut – light and shade, fast and slow, quiet and loud, its called music, but it takes time and skill and thought, and an audience wanting to appreciate, not a multitasking background playlist. I realised I was not on the same page when on a train into London the other day I found myself virtually the only person in the carriage not staring intently at a hand-held device, wires trailing from ears. The hell with that stuff. I was on my way to buy some records. 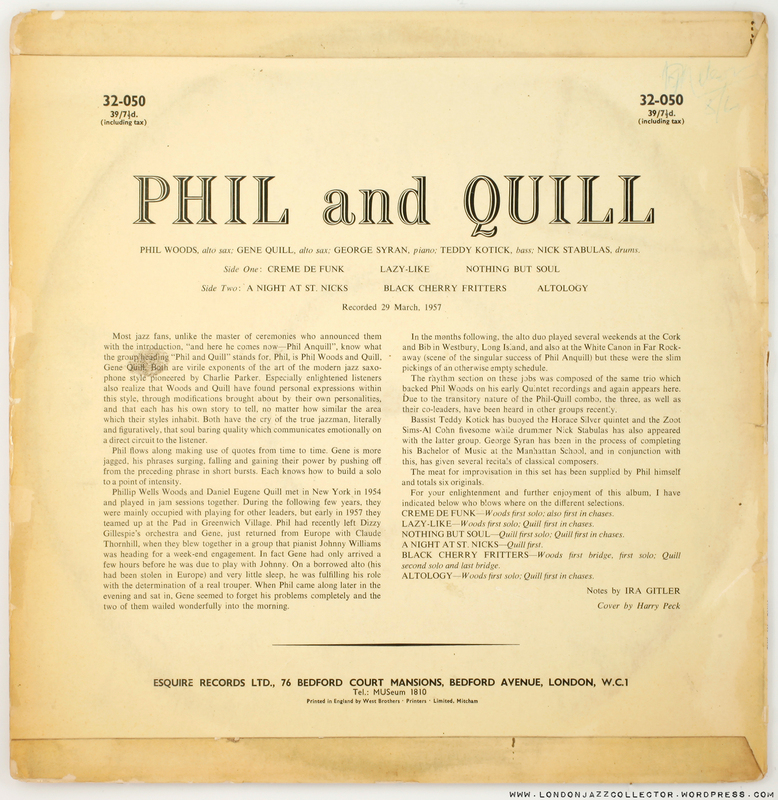 Phil and Quill mania – You wait ages for a Phil and Quill, then two come along at once. Notes annotated by a previous owner with NYC – March 15, 1956. Different line up and different song titles. Two altos and Bari. Interesting brass front line, and the magnificently named Shadow Wilson on drums. 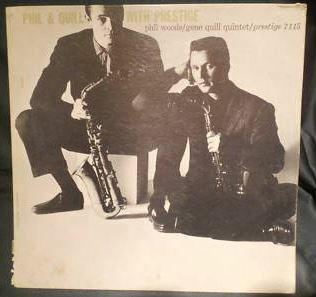 This entry was posted in Esquire, Phil Woods and tagged Esquire, Gene Quill, George Syran, Nick Stabulas, Phil Woods, Prestige, Teddy Kotick by LondonJazzCollector. Bookmark the permalink. If you like this one the check out “3 bones and a quill” with Gene Quill and ( yes you guessed it) three trombones. Quill’s on fire. Originally on Roost it was available on Vogue on these shores and in VERY good sound. Hi Adrian, thanks for recommendation. 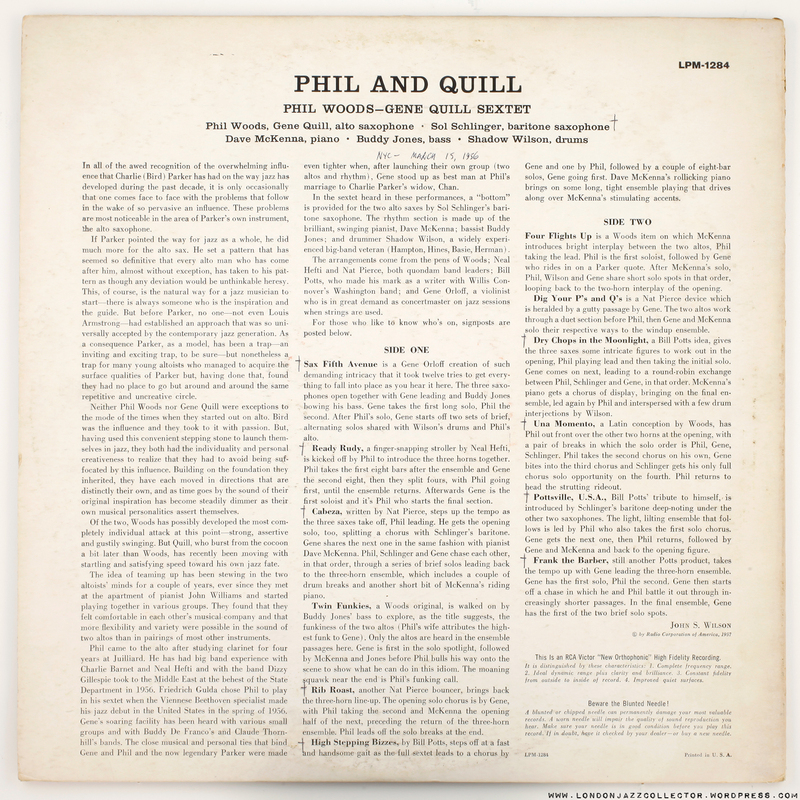 See postscript at foot of post – no shortage of “Phil and Quill” eh Busy fella, that Phil Anquill. 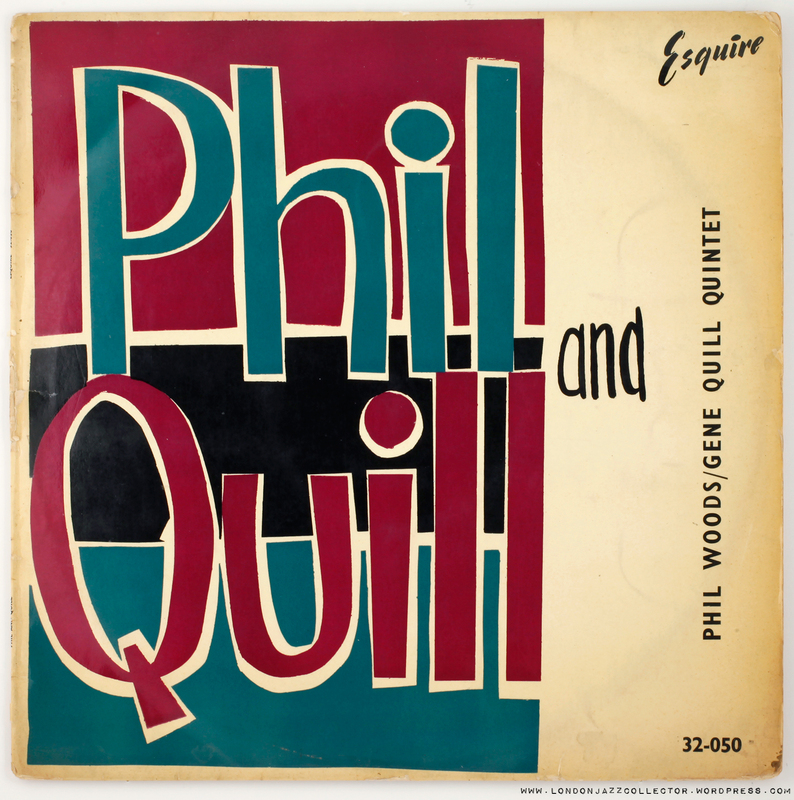 There is also a “Phil and Quill” record on Epic, they do some jazz standards including two takes of Doxy. Hi Adrian. Your enthusiastic comment encouraged me to get a download, and, yes, the sound is very good even in this format. It’s stuff that cries out for stereo, which basically would have been possible back then (I know from the Mosaic Johnny Smith set that Roost recorded in stereo as early as Sept. 1957) but wasn’t used on this date. I found it hard to follow the sequence of trombone solos, except Jimmy Cleveland whose signature is unmistakable in some cases. Quill sounds great on these tracks, and the trombone section adds spice. Nice catch! 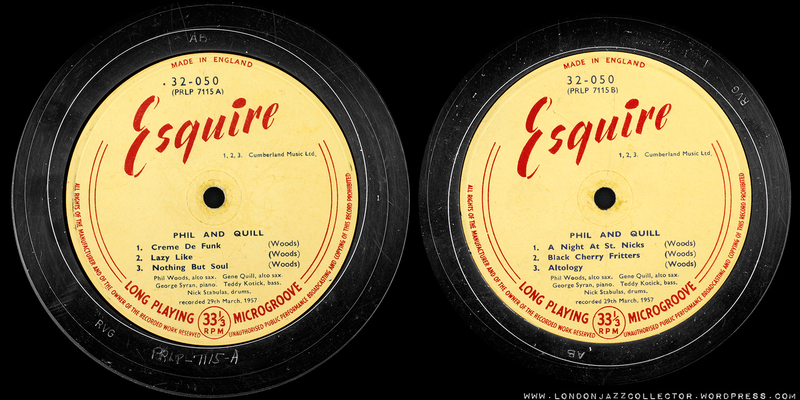 I have the original,but if I would run into the Esquire I would buy it for the cover and the sound.I try to find Esqiures here in Holland, but you seldom see them.Pressings are exellent.Congratulations!! A very fine album, with a nice Esquire cover. One needs to be alert all the time when listening to it, since the two are not always easy to keep apart. But rewarding when one can follow the threads. Congratulations LJC. You are coming there, slowly, but surely.